No matter the option you choose for your child’s religious education, it is important to remember that that Church believes that parents are the primary teachers of their children in the ways of faith. The parish, school, and teachers are secondary to the example parents give to their children. Our promise to raise our kids in the faith is not fulfilled by simply sending our kids to religious education. Attending mass every weekend, going to confession once a year, and participating in the life of the Church beyond Sunday mass are the most import ways we pass on the faith to our children. It’s by our actions we show them how important God truly is in our life. The school is our main ministry for educating our children. The faith is taught at each grade level in a specific way with a religion curriculum. The faith is also integrated into all the subjects and our Christian values are handed on in the daily life of the school. Students who attend St. Michael are taught religion at each grade level this also includes sacramental preparation for those preparing for first communion. However, because of its public nature confirmation is not taught during the school day and all preparing for confirmation are asked to come Wednesday evenings. Wednesday night religious education is for all grades. It begins with mass at 6pm followed by dinner for participants and their families and well as their teachers. While Wednesday Mass and dinner are not required, we do hope that you can take advantage of this. Life is very busy and we hope that this will give families a chance to slow down and at least spend some time in prayer and eat with each other. The classroom portion will begin at 7pm and end at 8pm. Dinner will be in the gym while classes will break out to their respective rooms with their teachers. We hope that parents can be as involved as possible this night and we highly encourage you to consider volunteering on a regular basis to either help cook and clean in the kitchen or assist in the classroom. We do ask that you volunteer at least once a semester. Another option for religious formation is our family formation program. As the name implies this program has the family as its main focus. Families enrolled in family formation are asked to come to one Saturday session a month. This session immediately follow Saturday evening mass. We share a meal and so each family is asked to bring a side dish or dessert while the parish will provide the meat. After the meal the children are broken into two groups, older and younger and each has a lesson taught to them by an adult assisted by middle school and high school aged kids. The parents and guardians and Fr. Jenkins will gather to discuss the 4 lessons that the parents will teach at home to their kids on a weekly basis. The lessons are very simple to accomplish at home even if the adults have no training in teaching. All the materials are provided for families even if there is a craft project. Fr. Jenkins will discuss the lessons their topics to help familiarize the adults and help to feel more at easy as they discuss the lessons with their children. The program really helps families talk about God with one another and helps to put parents and guardians at the front their child’s religious education. It helps the families learn and pray together. If a family has a child who will receive first communion this year, additional lessons and materials are provided for them. Families with confirmation aged kids will still need to have them attend Wednesday night. 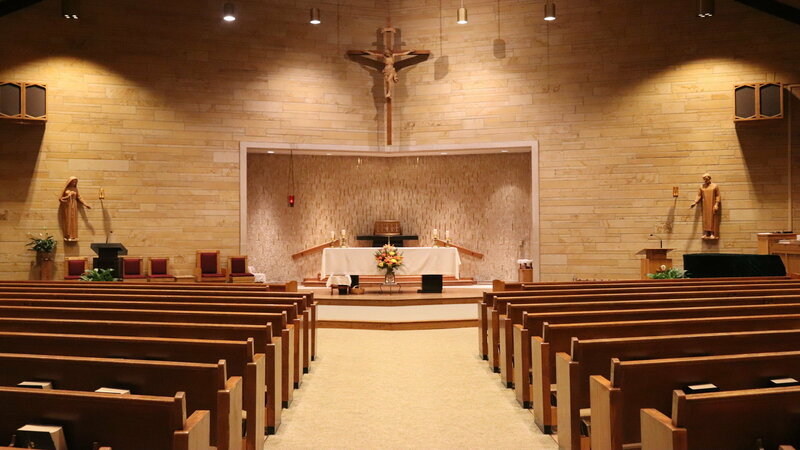 For those who schedule will not accommodate the Wednesday night or Saturday evening options you do have the option to participate in the Sunday morning religious education program at St.Thomas in Fortville. This also includes those preparing for first communion but not confirmation. St. Thomas and St. Michael’s are partner parishes and so St.Thomas families will also have the option to participate in our Wednesday night or Saturday evening programs. If you choose to attend religious education at St.Thomas please let them know you are members of St. Michael’s. For more information on their programs you will need to contact them directly for dates, times, cost, and any other expectations they might have. If you have a child in first communion who attends classes at St.Thomas we do have the expectation that they will still receive first communion at St. Michael’s or at St. Thomas if their families attend our religious education programs. First communion is open to a baptized Catholic who is in second grade. The requirements are that these students be enrolled in one of the options for Religious education and attend faithfully. The children will receive their first confession and first communion in the spring. More information will follow and can be found on our website. Be sure to indicate that your child will be receiving first communion when you sign up for religious education and if your child was baptized at different parish please have their baptismal record sent to St. Michael’s. If your child is in second grade or older and is not Catholic but you wish them to become Catholic please contact Fr. Jenkins. Requirements for First Communion, please click here. Confirmation is held for youth in the 8th grade. If your child is older than 8th grade they can still receive the sacrament but their preparation will be separate from the 8th grade class. Classes will be held Wednesday evenings. Confirmandi are invited to mass at 6pm and as well as the dinner that follows. The actual required class is from 7-8pm. Students are asked to attend faithfully and parents are asked to assisting at least once a semester in helping in the kitchen or assisting in the classroom. In the fall this help could also include assisting at the passion tide retreat which is a requirement for all confirmandi. More details can be found on our website and when the student is enrolled. Requirements for Confirmation, please click here. During the high school youth are invite to our regular youth group gathering that will follow the same schedule as our Wednesday night religious education. They are invited to mass and dinner. Afterwards they will meet in the youth room for social time. This time is not a structured class but is instead a place where students can hang out, play games, or work on homework. The adult supervisors are there to help mentor students. Evenings will end with a short night prayer.